If you are looking for nature and adventure on your next holiday, Queenstown is the place to go. It has been referred to as the ‘adventure capital of the world’ due to its abundance of activities. Visitors to Queenstown can go bungy jumping, hiking, white water rafting, skiing, and kayaking. The city centre is abuzz with activity. While it is small and compact, it is teeming with restaurants, cafes, shops, and bars to visit. Outside of the city, you’ll have access to some incredible nature. If you’re looking to experience the magic of New Zealand’s South Island, plan a trip to Queenstown for your next holiday. Hotels in Queenstown can get pricey, especially if you visit during the high seasons of summer and winter. To make the most of your travel budget, look into Queenstown holiday packages. Queenstown packages bundle together flights and hotels in order to save you both time and money. Webjet’s Queenstown accommodation and flight packages can save you up to several hundred dollars on your trip to Queenstown. With those savings, imagine all the extra activities you can try! With Queenstown holiday packages, there’s no need for you to trawl the internet for hours searching for the best deals. Webjet will do that for you, so you can focus your attention on the fun adventures you will have in Queenstown. Holiday packages to Queenstown are the perfect option for families who want to visit this exciting city without breaking the bank. There is one airport within easy access of Queenstown, NZ. Queenstown Airport (ZQN) is 8 kilometres (5 miles) from Queenstown in the neighbouring town of Frankton. It is the fourth largest airport in New Zealand and one of the main ports of entry for the South Island of NZ. Travelling from Australia, you can catch a flight to Queenstown with Jetstar, Virgin Australia, Qantas, Emirates, and Air New Zealand. If you are departing from Melbourne, Sydney, Brisbane, or the Gold Coast, there are direct flights to Queenstown available to you. Each of these direct flights will get you to your destination in about 3 hours. If you are travelling from another airport in Australia, you can get to Queenstown in no time with a stopover. Queenstown offers a variety of accommodations to meet every budget. While visiting Queenstown, you’ll have no trouble finding an accommodation option that offers stunning views and a relaxing vibe. The Aspen Hotel is located on the banks of Wakatipu Lake and offers unparalleled views over the water and mountains. The hotel is made up of 73 guest rooms that offer a comfortable and homely atmosphere. Many of the rooms even have a balcony overlooking the lake and the Remarkables mountain range–a view you will never forget. The Aspen Hotel is located a short distance from both the city centre and the Ben Lomond Scenic Reserve and is a great place to base yourself during your Queenstown holiday. This boutique hotel combines European style with the homeliness of a bed and breakfast. The hotel is located in a quiet spot just three minutes on foot from the lively CBD. The guest rooms have a beautiful European design and are equipped with a Juliet balcony overlooking the lake, mountains, or city centre. Each morning, guests of the hotel are offered a complimentary breakfast with views over Queenstown. The Heritage Queenstown offers stunning views over Lake Wakatipu and the Remarkables mountain range. The style within the hotel is modern and homely with a touch of sophistication. Both rooms and suites are available, and many come with a balcony. Each room offers a beautiful view, either of the lake and Remarkables on one side or the peaks of Ben Lomond on the other. Amenities at the Heritage include a swimming pool, spa, gym, and a restaurant overlooking Queenstown. Queenstown has been referred to as the adventure capital of the world. If you are looking to get your adrenaline pumping, this is the city for you. Queenstown has a compact city centre that is surrounded by lots of beautiful nature. Head outside of the city, and you’ll find some of New Zealand’s most famous landscapes. 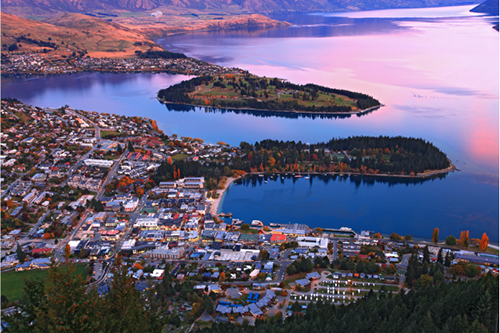 Queenstown is located on the eastern bank of this large lake. Lake Wakatipu is in the shape of a lightning bolt; and at 80 kilometres (50 miles) long, it’s the longest lake in New Zealand. Surrounding Lake Wakatipu, you’ll find a seemingly endless amount of activities to try. There are walking and biking trails that offer some amazing views. Or you can get directly out on the lake with a kayak or canoe. On the city side of the lake, you can pay a visit to the Queenstown Gardens. From the shores around Queenstown, you can also see an impressive mountain range called the Remarkables. The Skyline Gondola is one of the top attractions tourists flock to in Queenstown. The gondola is located just outside the CBD and travels to the top of Bob’s Peak. While riding the gondola, you’ll receive panoramic views of the city, mountains, and lake. If you would prefer to hike to the top of Bob’s Peak, that is also an option. The Tiki Trail takes a little more than an hour to complete, and once you’ve reached the peak, you’ll be rewarded with the views. Milford Sound tops the Queenstown bucket list for many travellers who visit the city. It is a fjord located near the coast. In Milford Sound, the best way to experience the beauty is to take a sailing tour through the area. Surrounding Milford Sound, there are also a variety of hiking trails to walk along. If you are driving to Milford Sound from Queenstown, the journey will take you about 3 hours 30 minutes. It is possible to see Milford Sound in a day, but to truly appreciate it, plan to spend at least 2 or 3 days there.